Indian Army had Invited Application from eligible candidates for B.sc nursing course 2018. Now the army board going to the Organized written exam for admission to 04 years B.Sc Nursing Course. Many Students apply to the Nursing Course 04 year Of Indian Army. 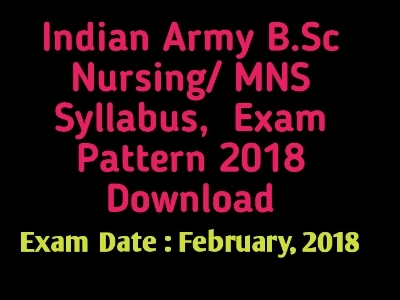 Indin Army B.sc Nursing written exams date fixed in February 2018. Are you looking for Indian Army B.Sc Nursing Course Exams Syllabus, exam pattern? Then here is the best place for you. Today GK Solve share Indian Army B.sc nursing Syllabus, Exams Pattern PDF file for you. You can download Indian Army B.Sc Nursing 04 years Course written exams syllabus, pattern from our website. Candidates can check Indian Army B.Sc Nursing Exams Syllabus & Pattern. 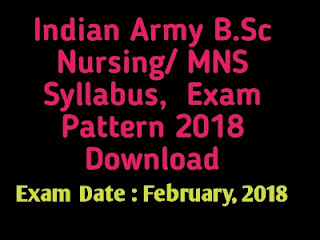 Download link to Indian Army B.Sc Nursing Exams Syllabus & Pattern Available here. So the Candidates are requested to download Army B.Sc Nursing Syllabus as soon as possible. Exam Time : 90 min. All exams syllabus, pattern, updated our site on daily basis. Keep Visiting Daily.